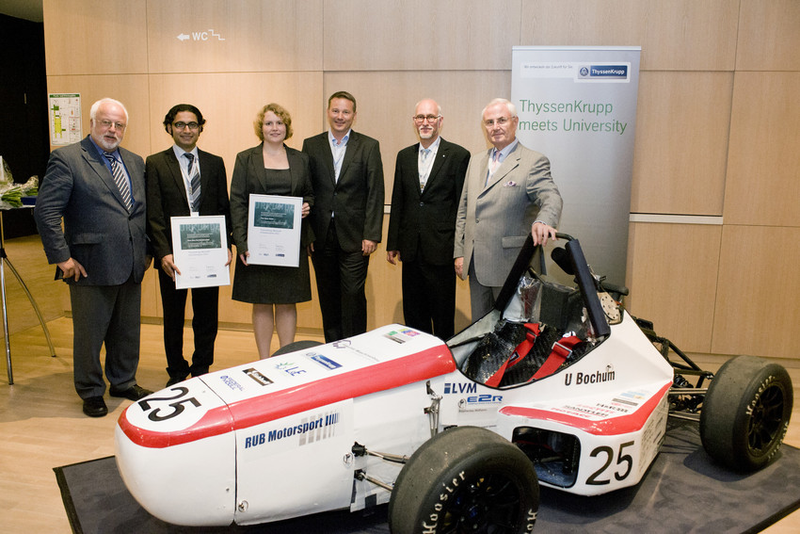 This year the "ThyssenKrupp Werkstoff-Innovationspreis" (engl. ThyssenKrupp Material Innovation Prize) has been awarded to two scientists of ICAMS: Aenne Köster and Reza Darvishi Kamachali. Both scientists were honored for outstanding scientific publications in the field of scalebridging materials simulation. Ms. Köster recently published a scientific paper on an "Atomistically informed crystal plasticity model for body-centered cubic iron" in the renowned international journal Acta Materialia. Mr. Darvishi published an article on "3-D phase-field simulation of grain growth: Topological analysis versus mean-field approximations" in the same journal. ICAMS congratulates both scientists for their outstanding achievements. The award ceremony took place in Essen in the framework of the Ideenpark. Award ceremony. From left to right: Prof. Dr.-Ing. Michael Pohl, Reza Darvishi Kamachali, Aenne Köster, Prof. Dr. Alexander Hartmaier, Prof. Dr. Elmar Weiler, Prof. Dr. Ulrich Middelmann.